With this article, I aim to provide runners with a resource about the acute effects of racing on the heart and the long-term effects of running (or regular cardiovascular exercise) on the heart and on our health. The long-term effects of running on the heart and on health in general are overall very beneficial. Specific cardiac changes can occur in endurance athletes, which runners should be aware of. In very rare and specific circumstances—which are outlined in this article—running can result in collapse or death due to problems with the heart. It was an exceptionally warm and humid day on the coast of Denmark. A physician friend and I were running a point-to-point marathon, mostly together, both pushing it. It was the kind of day where a breeze would have been delightful, but there was a tailwind the entire way. Normally, this would be helpful, but it felt like my sweat was just not evaporating. The two of us crossed the finish line within minutes of each other—both ecstatic to be done—hugged, and looked forward to the post-race festivities. But then, a couple minutes behind us, a middle-aged man came sprinting across the finish line against another runner, clutched his chest, and then collapsed. I think of this instance often when people ask me now, as an endurance-sports researcher and physical-medicine and rehabilitation doctor, if running is safe for the heart. What is the short-term risk of suffering a cardiac event (“heart attack” or dangerous cardiac rhythm) while running/racing? What are the long-term effects of running on the heart? The answer to Question 1 is that there is, indeed, a slightly increased risk of a cardiac event during strenuous exercise, if you are predisposed (by coronary-artery disease, hypertrophic cardiomyopathy, and many other conditions, the most common of which are listed in Figure 5). However, this risk is overall very, very small. The answer to Question 2 is that running and exercise greatly improve cardiovascular health and decrease your cardiac risk and overall mortality. Cardiac arrest is when the heart stops pumping blood. Cardiac arrest can be caused by lack of blood flow to the heart itself (a “heart attack”), most often due to coronary-artery disease, or by a structural abnormality of the heart that causes it to suddenly start beating irregularly (an arrhythmia) and ineffectively. These are more likely to occur anytime the heart is working harder to pump blood, such as during exercise. Figure 1. The outside of the heart. The heart gets its blood supply from the coronary arteries. When the heart does not get enough blood through these arteries, a person can experience a “heart attack” or myocardial ischemia. Heart attacks are the most common cause of sudden cardiac death in runners over 40. Image by the The Society of Thoracic Surgeons. Figure 2. The inside of the heart. Alterations in the anatomy of the heart can interfere with the heart’s ability to beat regularly. When the heart beats irregularly, that is called an arrhythmia. Certain types of arrhythmias can cause sudden cardiac death. Image by The Society of Thoracic Surgeons. Sudden cardiac death caused by either a “heart attack” or an arrhythmia can sometimes be reversed with CPR, especially if started quickly after the collapse and a defibrillator is present. CPR should always be attempted when a person collapses and is pulseless. Fortunately, the risk of sudden cardiac death during a marathon is exceptionally low at 0.0008-0.001%, but higher than in a half marathon, which is 0.00027% (Kim, 2012; Redelmeier, 2007). Just to put this in perspective, this is the approximate equivalent risk of riding a motorcycle for two hours, cycling for 10 hours, or riding in a car for 28 hours (Redelmeier, 2007). 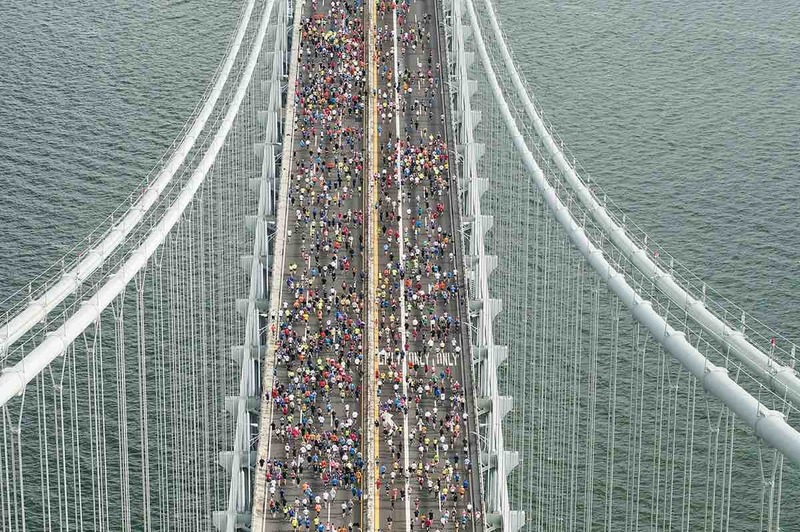 And, in fact, due to street closures in big-city marathons, it is estimated that there is a 35% decrease in overall mortality due to marathons because of the prevention of motor vehicle accident deaths (Redelmeier, 2007). As for ultramarathons, I have found only a handful of cases of cardiac arrest reported. Two were at the Comrades Marathon in 2007 when two men collapsed with cardiac arrest near the finish line. One was resuscitated but died in the hospital; the other collapsed near the finish and was carried by runners across the finish line, apparently delaying medical attention, and that runner was not revived (Ross, 2007). The most likely causes of sudden cardiac death during exercise are dependent on the person’s age. 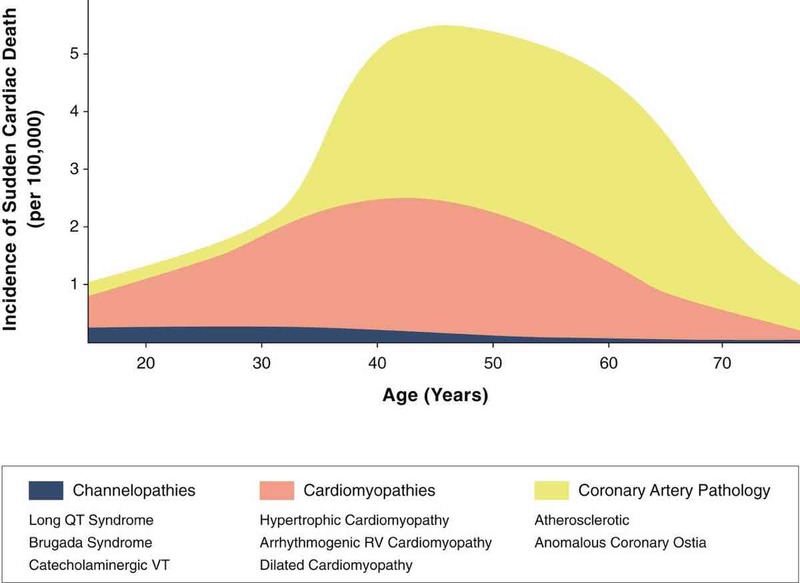 In athletes under 40, it is typically a congenital condition (see Figure 5) and in runners over 40, it is most often coronary-artery disease. Figure 5. The relationship of channelopathy, cardiomyopathy, and coronary-artery pathology with the incidence of sudden cardiac death. Note that channelopathies and cardiomyopathies both predispose to irregular heartbeats (arrythmias), which can cause the heart to pump ineffectively. 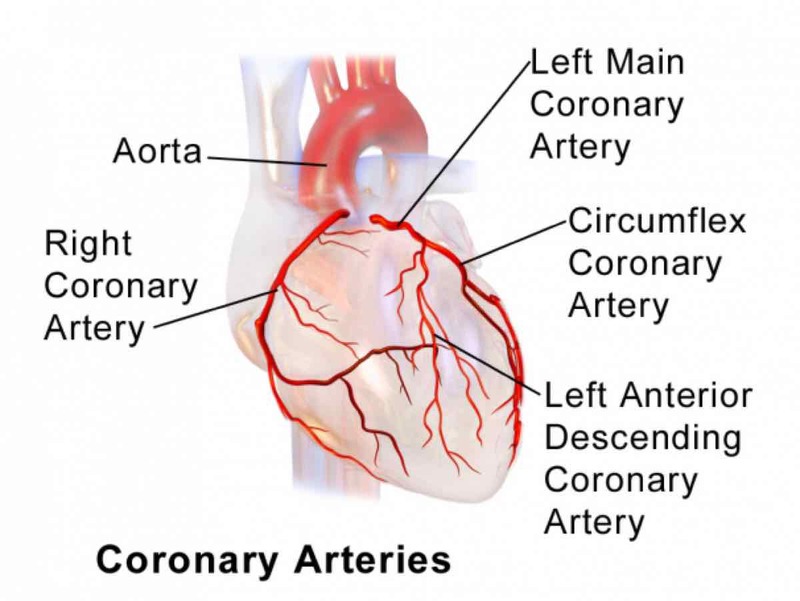 Coronary-artery pathology predisposes to “heart attacks” (when the heart does not get enough blood). Image from Cardiac Imaging and Stress Testing Asymptomatic Athletes to Identify Those at Risk of Sudden Cardiac Death. Andre La Gerche, Aaron L. Baggish, Juhani Knuuti, David L. Prior, Sanjay Sharma, Hein Heidbuchel, Paul D. Thompson JACC: Cardiovascular Imaging Sep 2013, 6 (9) 993-1007. Indeed, as the average age of marathon runners increases and, if more runners with unknown, underlying coronary-artery disease try the marathon distance, we can expect the overall number of marathon-associated sudden cardiac deaths to increase. And this is a good time for my plug for having a defibrillator available at all races, even if races are small. I would also encourage all runners and aid-station workers to get certified in basic life support so they can perform CPR if necessary. Now for the really good news: in a 15-year study comparing runners to non-runners, runners had 45% and 30% lower adjusted risks of cardiovascular and all-cause mortality, respectively, with a three-year overall life-expectancy benefit (Lee, 2014). Figure 6. 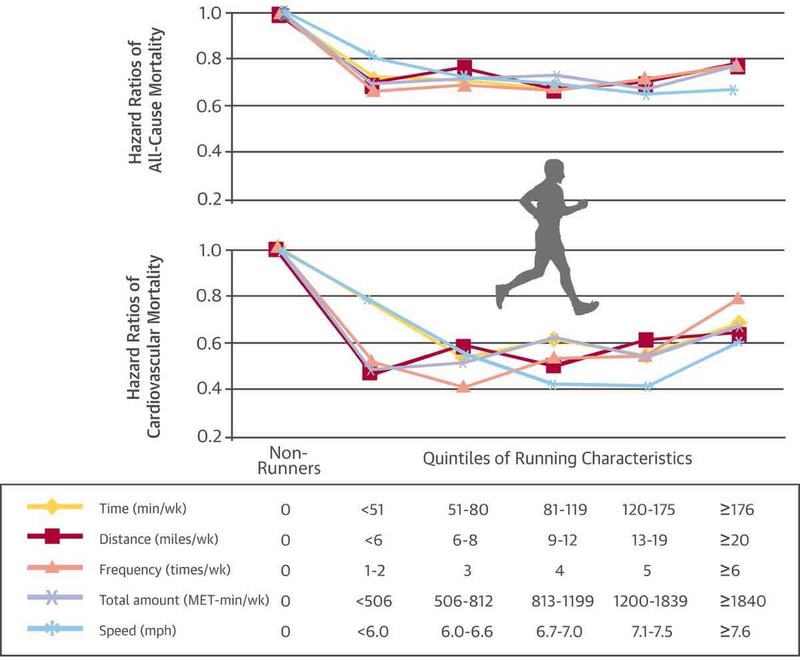 A demonstration that, regardless of speed, distance, or time spent running weekly, runners have lower rates of cardiovascular and all-cause mortality than non-runners. Image from D.C. Lee, R.R. Pate, C.J. Lavie, et al. 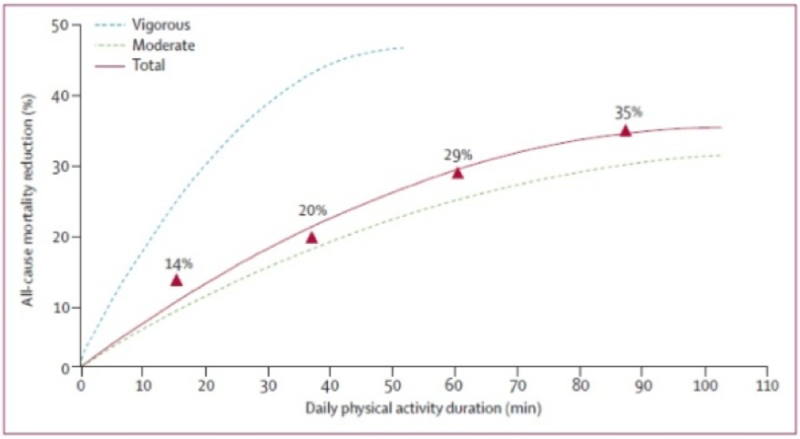 Leisure-time running reduces all-cause and cardiovascular mortality risk J Am Coll Cardiol, 64 (2014), pp. 472-481. 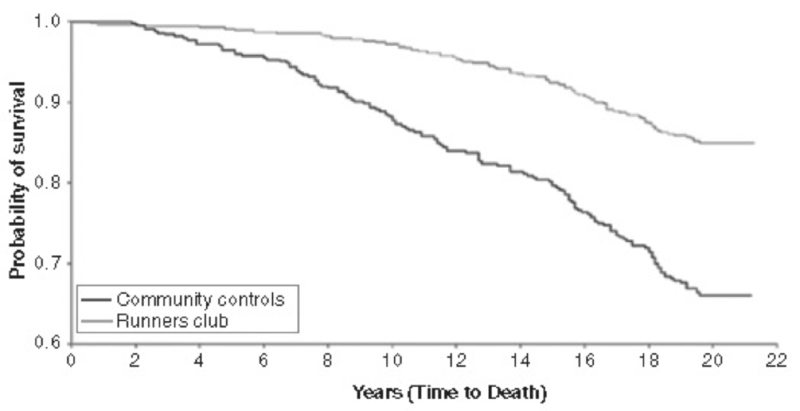 Another study (Chkravarty, 2008) compared the 21-year survival rate of a runner’s group compared with healthy controls and, even after adjusting for co-variates such as age, the runners had over a 40% survival benefit, which, as shown in Figure 7, continued to widen as the runners aged. Figure 7. The relationship of runners and non-runners and mortality. Image from Chakravarty EF, Hubert HB, Lingala VB, Fries JF. Reduced disability and mortality among aging runners: a 21-year longitudinal study. Arch Intern Med. 2008;168:1638-1646. The previously listed benefits do not appear to be unique to running, however, as physical activity in general is associated improved survival (Wen, 2011). This prospective study also showed the more people exercised and the more vigorous it was, the greater their reduction in all-cause mortality (see Figure 8). Figures 8 and 9. 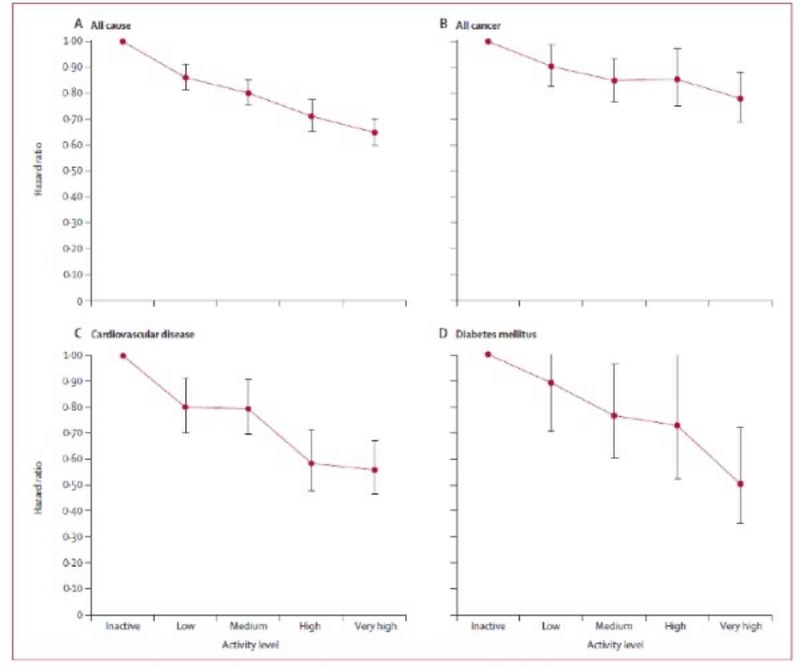 The relationship between the rate of daily exercise and various health problems. These images show not only a reduction in cardiovascular deaths, but also interestingly in cancer-related deaths and in all causes of death. There appears to be a dose-response relationship where increasing amounts of activity appear to confer a larger survival advantage for the above major causes of death. Both images from Wen CP, Wai JP, Tsai MK, et al. Minimum amount of physical activity for reduced mortality and extended life expectancy: a prospective cohort study. Lancet. 2011;378:1244–53. Endurance athletes’ hearts adapt to regular training. 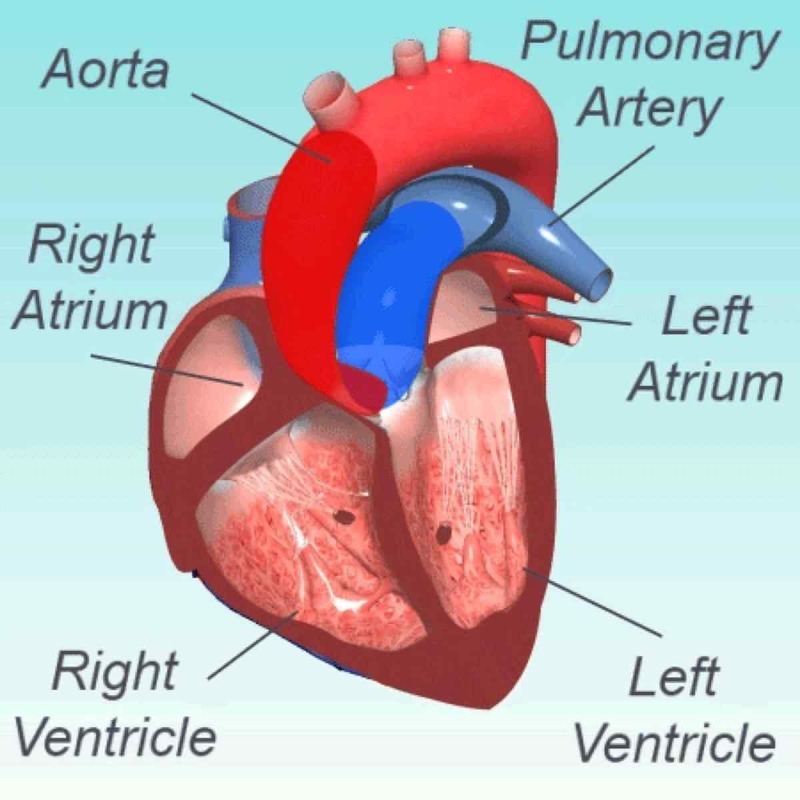 The left ventricle enlarges (see Figure 2), allowing it to pump blood more efficiently during exercise. This ‘eccentric hypertrophy’ is important in improving endurance performance and the function of the left ventricle remains normal, even improved, during exercise. The right and left atria also enlarge, which are generally also felt to be physiologic adaptations and, the only major concern presently about these is the enlarged left atrium may be the reason endurance athletes tend to develop atrial fibrillation/flutter. (Read on for more information on this.) Particularly strenuous marathons and ultramarathons have been shown to reduce cardiac function temporarily once the race has finished, but function appears to, without exception, return to baseline within one week, thus strongly suggesting there is no permanent heart damage done (George, 2012). One thing that has historically concerned physicians about marathon running is the immediate post-race elevation in enzymes that are normally released during a heart attack, including cardiac troponin. However, these laboratory values quickly return to their baseline normal level (within 24 hours) after a marathon and remain elevated for six days after a myocardial infarction (“heart attack”). It is generally felt that the release of these enzymes is inherent to and expected with exercise and potentially a sign of cardiac strain or simply due to increased blood acidity or temperature (George, 2012). The release of these enzymes has not been found to be a sign of permanent heart damage and has not been related to negative health outcomes (George, 2012). Unfortunately, there is a growing body of evidence that endurance athletes have a greater prevalence of atrial flutter/fibrillation compared to non-active controls (Mont, 2002; Molina, 2008 Mont, 2009). The most convincing evidence of this was published by Andersen, et al in 2013. They prospectively studied 52,755 long-distance cross-country male skiers, who participated in the Swedish Vasaloppet. As shown in Figure 10, both faster finish time and higher number of races increased the risk of developing an arrhythmia. Specifically, each Vasaloppet completed conferred a 6% increased risk of developing an arrhythmia and faster finishers who had completed five or more Vasaloppets had about a 30% increased risk of arrhythmia. It is important to note that all of the above studies included only men. Figure 10. Faster Vasaloppet cross-country ski racers and racers who have competed more than five times both have a significantly increased risk of cardiac arrhythmias. Image from Andersen K, et al. Risk of arrhythmias in 52 755 long-distance cross-country skiers: a cohort study. European Heart Journal, 2013. Two recent cross-sectional studies from Germany (Merghani, 2017) and Holland (Aengevaeren, 2017) taken together suggest there is a higher prevalence of calcific-type coronary-artery plaques among athletes, especially those with the most exercise exposure. This plaque type has been found to be more stable (less likely to cause myocardial infarction) and there are currently no data to suggest that these specific plaques in an athletic population are associated with negative health outcomes. In an editorial (Baggish & Levine, 2017), it is suggested this plaque morphology may be yet another “benign” adaptation to exercise. More data are needed to draw conclusions, but Michael Joyner, MD, an anesthesiologist sports researcher at the Mayo Clinic states “stable plaque plus larger coronary arteries that dilate more in high-volume exercisers should be highly protective against coronary events” (Huston, 2017). Which Runners Should be Screened for Cardiovascular Risk and How? Screening electrocardiograms (EKGs) are often expected to be part of the pre-participation physical in Europe, however. This is based upon recommendations by both the European Society for Cardiology and International Olympic Committee. This is largely because of the findings of an Italian study (Corrado, 2007) that was able to show a reduction in cardiac death after the initiation of EKG screening. Screening EKGs are not recommended by the American Heart Association or the American College of Cardiology based on a similar American study (Steinvill, 2011) which found that mandatory EKG pre-participation screening did not reduce the rate of cardiac death. It should be mentioned that the Italian study was prospective and could determine cause, whereas the American study was retrospective and could only find an association. In conclusion, there is overwhelming evidence that regular endurance exercise is associated with reduced risk of cardiovascular and all-cause mortality. If you do not have an underlying heart condition or disease, your risk of sudden cardiac death during a race is essentially zero. There should be no generalized recommendation for adults or children to reduce exposure to running or exercise. So go ahead, keep running (! ), and on a rest day, consider getting certified in basic life support. Your heart and your running, what can you tell us about it? What have you learned from your physician about the condition of your heart over the years? And has your heart changed over your lifetime as a runner? Have you seen a cardiac event at an ultramarathon? Can you share what you observed? Andersen K, et al.. Risk of arrhythmias in 52 755 long-distance cross-country skiers: a cohort study. European Heart Journal, 2013. Chakravarty EF, Hubert HB, Lingala VB, Fries JF. Reduced disability and mortality among aging runners: a 21-year longitudinal study. Arch Intern Med. 2008;168:1638-1646. Corrado D, Basso C, Pavei A, Michieli P, Schiavon M, Thiene G. Trends in sudden cardiovascular death in young competitive athletes after implementation of a preparticipation screening program. JAMA. 2006 Oct 4; 296(13):1593-601. George K, Whyte GP, Green DJ, et al The endurance athletes heart: acute stress and chronic adaptation Br J Sports Med 2012;46:i29-i36. Hicks, M. Personal communication. 2018. Huston, L. Coronary artery calcium rises with intense exercise. Cardio Brief. 7/13/2017. http://www.cardiobrief.org/2017/07/13/coronary-artery-calcium-rises-with-intense-exercise/. Kim et al. Cardiac Arrest During Long Distance Running Races. N Engl J Med 2012; 366:130-140. Marathon des Sables Training Blog. 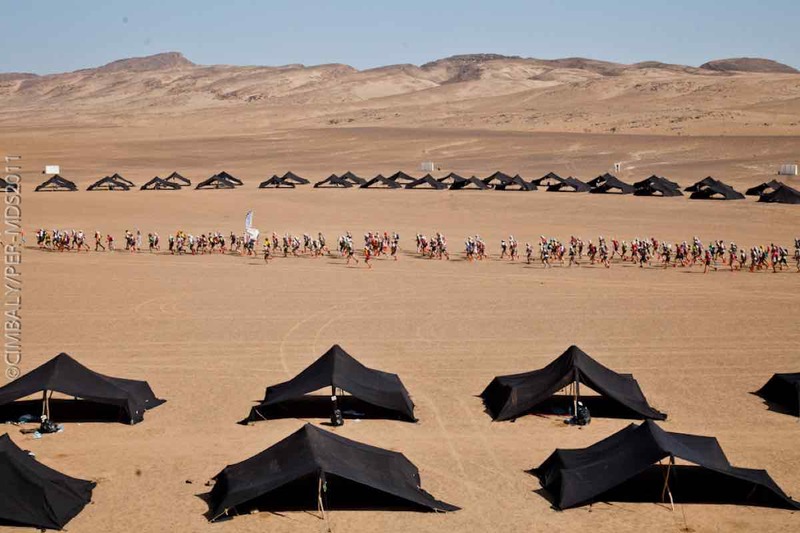 http://mds2008.blogspot.com/2007/04/death-on-marathon-des-sables.html. Molina L, Mont L, Marrugat J, et al. Long-term endurance sport practice increases the incidence of lone atrial fibrillation in men: a follow-up study. Europace 2008;10:618–23. Mont L, Sambola A, Brugada J, et al. Long-lasting sport practice and lone atrial fibrillation. Eur Heart J 2002;23:477–82. Thank you so much, Madhu. That is really great to hear. I agree there is a lot of false (and often scary) information out there – a major reason I wanted to cover this topic! Cheers! Great article! Well written and very informative. Good article in the main, but—I believe it significantly downplays the real risk of atrtial fibrillation developing over time as recreational endurance runners both continue to (a) run far and (b) age. We can all agree that running is terrific exercise, holding out many heart health benenfits; still no exercise is perfect for everyone, throughiut the entirety of their ifespoan. [Sure, there are 80 year-old distance rnners, but the reasn we hear about them is because they are newsworthy, ie the exception.]. Naturally readers of irun far don’t want to acknowledge that running long distances can actually impair health over time—and BTW the risk of evelopimng a fib among long distance runners is signifcant compared to the overall population—but we all deserve accurate info rather than cheerleading. Just as avid skiers know the risks involved, so, too, should we be aware that there are risks associated wth running…. Another great article, Dr. Høeg — thanks! David, I agree. I think the evidence (heightened by my anecdotal experience) regarding afib among endurance running is compelling, and there is interesting research to be done in the area only after there is sufficient interest and acknowledgment of the problem. Somewhere between our desire to rationalize running as long as we want, as long as we want; and James O’Keefe’s cardiological alarmism; lies some interesting unknowns. For example, do deleterious, irreversible structural changes occur in middle age, or later? Does “time off” as we get older help reverse remodel the heart? Is it occasional hard racing, or sustained yearlong training, that is better or worse for middle aged or older athletes? Are shorter events at harder effort better or worse for heart health of aging athletes (or is the die cast in the preceding years)? How does nutrition factor into this? It does seem that XC ski racing and cycling have been more forthright in acknowledging the problem, and based on the demographics of the recent ultrarunning boom, we should try to get ahead of the curve in understanding it within ultrarunning. What’s your source for a) ‘running long distances can impair health over time’ and b) ‘the risk of developing a fib among long distance runners is significant compare to the overall population’? richr: the Molina, 2008 reference is but one, directly from this article. Wouldn’t it be wonderful to know if it were were mostly a biological difference, or if women’s training/racing/eating patterns were (more generally) protective? cardiologists over the course of my diagnosis, initial treatment, surgery, hospitalization, rehabilitation, and ongoing followups. Every one of them knew I was (and am still trying to be…) a high-ish-mileage runner, and none of them ever once told me to cut back because I could potentially develop atrial fibrillation. If anything, they were doing everything they could to get me back to running. Maybe I’m deluding myself, but I personally feel like the atrial fibrillation thing is over-hyped. Certainly so for the “average” runner. David, thanks for the comment. I was definitely not trying to downplay or hide any high quality available research out there, which is why I did mention the association between endurance exercise and a fib. Do you have other research pointing at associations between long distance running and poor long term health outcomes? I would be really interested to learn what it is you are referring to. DL: I agree with you that there are probably risks in running too many long-distance runs but what is one supposed to do? Run limited miles, forgo the races that you love by playing it safe and then proceed to tell yourself that you are living? Many would rather take their chances and keep running ultras and feel alive. You can’t live forever…..at least not yet, but that’s another discussion altogether. Great article! And nice to know I could still gloat (perhaps maximally so) about the health benefits of my hobby while only running 6 x 8min/miles per week. I was diagnosed with dilated cardiomyopathy 2 years ago. Completely asymptomatic and sort of by chance that it was found. My cardiologist doesn’t think it’s exercise induced and has put me on beta blockers. Do you believe there is a psychological effect to one’s running ‘performance’ knowing vs. not knowing of this condition? I feel as though the mental component has impacted my training over the last several months. HJ, I am sorry to hear that. I wonder if the beta blockers are affecting your performance. If you are not able to get your heart rate up like previously (beta blockers keep you from getting your heart rate up), you would not be expected to be able to train at the intensity you did before. But that may be a reality you need to live with since, as far as I understand, that is an important medication for you to be on for your heart condition. But your cardiologist will be the best one to ask about that. I will suggest that concerns about increased frequency of heart arrhythmias in endurance athletes are very much hyped beyond what (little) data there are to support any general concern. A recent book (https://www.amazon.com/Haywire-Heart-exercise-protect-heart/dp/1937715884/ref=sr_1_1?ie=UTF8&qid=1526414773&sr=8-1&keywords=haywire+heart) does a nice job of reviewing the physiology of the heart and summarizing what data exist for concerns but, unfortunately, hypes the observed (very small) increases that have not been properly adjusted for confounding lifestyle variables and genetic disposition. Remember that Medicine is not Science and it is incumbent that one review in detail whatever study is being referenced. Also, it must be pointed out that the increases in frequency of these arrhythmias is the incremental increase over an underlying risk. This confuses many and leads to unnecessary hype and unfounded concern. In the case for atrial fib (AF), the underlying risk is about 2% in the general population but is found to be very much a function of age where the currently established epidemiological incidence goes from about 0.15 % at age less than 49 to 4% in the 60-70 age range and to 14% above 80. The skimpy data that potentially indicates an incremental risk of AF for endurance athletes, such as the 6%-30% increased risk noted above for the Vasaloppet population studied, would lead to the total risk of developing AF to rise from the observed 2% in the general population to 2.12% to 2.6% (as a function of number of Vasa races). Of course you need to adjust the underlying basis risk for your age, but relative to a similar age non-athlete the potential increased risk is small in my opinion. Additionally, given all of the other health advantages of being an active endurance athlete, these potential risk increases (even if you choose to accept the very defective supporting data), suggest that there is nothing to be concerned about. However, should one have an “event” it is best to not ignore it and attempt to find a qualified and informed physician to look into your condition (good luck on that one). Thanks for the insight and references, B.
I just recently noticed missing beats when taking my BP. I went to my dr. He did an EKG and said it was normal but referred me to a cardiologist mainly because I was overdue for a visit anyway. I’ve learned a lot over the last few days about heart rhythms and probably a lot that I don’t understand. I ordered an personal ECG to be able to monitor and see what exactly was going on. Most missing beats you feel with a pulse are actually extra beats, arrhythmia like PACs, PVCs ectopic beats. The happen so soon after a beat that the heart does not have much blood so you don’t feel the beat from a pulse. With the ECG I saw that I was having a lot of Premature Atrial Contractions, PACs. I don’t notices them at all, also it said I had bradycardia, a slow heart rate <60, normal for endurance athletes, my RHR is between 50-60, I've only been running for 6 years.20-30 miles a week up to 50-60 during a training cycle. I also read that arrhythmias are not uncommon in the general population and increase with age, most people never notice them. The only reason I did was from the beeping from the BP machine. My appointment with the cardiologist is next week so I'll see what he says. I do have a history of arteriosclerosis but not in the heart. Mike, PAC’s are common in both exercising and non-exercising populations, which is why we need these large epidemiological studies to help determine if exercise is associated with an increased or decreased risk. Sorry you are having to deal with this and I am glad you are going to follow up with a cardiologist who hopefully can give you some helpful and reassuring advice. Thanks for the great article Tracy. Have you seen any research on ultra running post heart attack(s)/stent(s)? Tommy, no I haven’t, but great question. I have seen a runner have to drop early in a ultramarathon after having a stent placed just a couple weeks prior. It seemed like a pretty dangerous situation for this person. You definitely would want to build up gradually in intensity and duration with your running once your cardiologist clears you for exercise. My Dad had his first bout with afib when he was 26, 30 years ago. It was a rapid afib incident, and as he describes it, it was an attack of paranoia to where he almost blacked out. His HR was well into the 200s. It runs on his mom’s side of the family. I’ve learned more about his condition over the years and knowing it’s in my family, I keep a close tabs on cardio health. My mom’s side who all drank and smoke, ironically didn’t have heart issues (go figure.) My Dad does neither and just recently had another bout with it. Stress and fatigue is the number 1 trigger for his irregular beats. Unfortunately he shied away from any kind of physical training in his 20s due to fears of cardio issues. I am not quite sure that was the best route, as I believe he sold himself short of overall health and stress mgmt, but we can’t go back in time. His valves and blood work are clean, which points to some abnormal electrical issue. No signs of cholesterol or blockage. Afib is an odd condition. South Africa is interesting, as most ultras are run in the buildup to Comrades, and usually boast large numbers of runners, many of them beginner marathon and ultra-marathon runners (and many seasoned runners as well). Just a minor detail. The rate of cardiac arrests in the Marathon des Sables (MdS) compared with marathons is, I suspect, increased 20-fold rather than 200-fold. Early in the article it is reported that “the risk of sudden cardiac death during a marathon is exceptionally low at 0.0008-0.001%”, but then later in the article the 0.02% rate for the MdS is divided by 0.0001% (not 0.001%) to arrive at the figure of 200. A 20-fold increase for the MdS is, I feel (as a former participant), understandable given not only its greater distance but also the high average age and of course the extreme Saharan heat. A great article in general. However, we must not downplay the significance of atrial fibrillation. This can be a debilitating condition that may need life long therapy with drugs that are associated with potentially serious side effects. Atrial fibrillation is also associated with heart failure and a source of strokes. The cause of arrhythmias may well be associated with cardiac fibrosis that affects the conducting pathways in the heart. Any activity usually has a dose dependant effect and too much of it may not be healthy. The study by Andersen seems to confirm that. Great article. I thought it may be useful to highlight another rare condition that may be worth knowing about, especially for the female readers. There is something called SCAD, spontaneous coronary artery dissection (https://www.mayoclinic.org/diseases-conditions/spontaneous-coronary-artery-dissection/symptoms-causes/syc-20353711), which is very rare but does happen in healthy/fit young-ish women. One of the risk factors is extreme exercise. 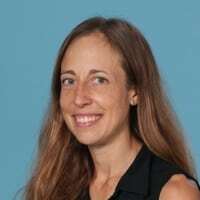 I am a 29-year old woman, running 6-10 miles 5x/week, and had some chest pain arise while running uphill recently, and it recurred with exertion on subsequent runs. By process of elimination, it has been determined to be pericarditis/myocarditis, but my cardiologist urged me to have an angiogram taken to rule out SCAD, as it is a dangerous condition and can lead to sudden death. Either way, I need to not run for a while (2 weeks for the pericarditis), but I’m relieved that it’s not the more serious of the two conditions. Be careful, runners, chest pain is serious! Thank you for your succinct and informative article. At the age of 44 (2007), I suffered my first MI (circumflex) having no previous cardiac concerns. I had been a recreational runner throughout my life and ramped up my training to race about seven years prior. In the year before my second MI (LAD) at 49 (2012), I ran four 50 km ultras. Fortunately, my cardiac health has been stable since 2012. I believe that, despite having had two heart attacks, it has been my overall physical (including cardiac) fitness that enabled me to not only survive, but continue to thrive in my athletic endeavours. Still, I am always mindful of the potential for further cardiac concerns, my life and running goes on! I appreciate those who are saying the incremental risk of developing atrial fibrillation is not worth worrying about. I have A-Fib and am struggling to re-create a basic quality of life, an identity even. For background, I fit the classic criteria–college athlete, took up marathons for 6 years, then ultras for 21 years. I completed 14 100-milers (DNF another 2 in the 60s) and finished 20+ other runs 50-miles or longer. I was persistent (stubborn even). I was in the top third in my early 30s, around the 60th percentile approaching age 50. My first symptoms were in 2006, with the longest episode probably only 5-20 minutes long with a frequency of 2-3 times per year. I’d go years without symptoms. In about 2012, I recall doing a 50k during which it reached 109F! I had arrhythmia, sat down, cooled off, and finished the race. (I even pulled a poor fellow into a creek who was having a seizure with heat stroke, then waited watching his airway until the ambulance arrived.) Still, I pushed on. My last ultra was in 2013–a mountain 100-miler. I did some 20+ mile mountain runs the next couple years. In 2015, I ended up in the ER with heart rate of 155 and irregularly irregular arrhythmia (classic AF). I cleaned my diet, reduced stress, and trained back up for a half-marathon in 2017. I went arrhythmic at mile 5 and life has been a challenge ever since. I had two catheter ablations last year (general anesthesia, burning the inside of the left atrium), neither of which has been successful. (Success rates are up to 80% in high-volume centers now.) My longest walk last year, which I trained for, was 13 miles, jogging 4 of it. I’m on an antiarrhythmic, a beta-blocker, and an anticoagulant to prevent stroke (the biggest risk). Now, two months after my second ablation, my daily average is a two-mile walk with a half mile of it jogging downhill at a 12-13 min/mile pace. At 54 years old, I am a retired ultrarunner. I’m a retired marathoner. I’ll probably not run a half-marathon again. If I get my heart rate up to 130 for more than about ten minutes, I go arrhythmic for 3-24 hours, stopping it with more meds. This involves a mild headache, fatigue, inability to do much, cognitive deficit, and sadness. It was awfully hard to watch my wife lace up for a 30-miler last Saturday. She’s still racing 50s and I’m grieving. I actually came here looking for others in the same boat. There must be a support group for retired ultrarunning addicts somewhere. Read the Haywire Heart. Love your life. And love your runs, even when the weather is miserable, or you are truly hurting. I miss the activity and the wonderful community. If you have the least bit of arrhythmia, take a few weeks off, read a bunch about AFib, and see a cardiologist, preferably an electrophysiologist, ASAP.